Fine Detail Paint Brush Set – 12 Specially Crafted Miniature Brushes for Art Painting, Models, Nail Art. Suitable for Acrylic, Watercolor and Oil. Buy Now ! ?? PREMIUM DESIGN FEATURES - Benefits of Taklon synthetic bristles over natural animal hairs : less prone to damage from solvents and paints; less prone to breakage; excellent shape retention, more hygienic, animal product free, clean with minimal effort, both with soap and water or with solvents as needed. ?? EXCELLENT VARIETY FOR FINE DETAILS - Short handles for precision work. 12 brushes with crystal clear labeling system showing size and type (Liner sizes: 1, 0, 00, 000, and 0000), (Round sizes: 1, 0, 00, 000, and 0000), and (Flat sizes: 1 and 0). You'll always have the right brush to create those perfect details. ?? ACCOMMODATES NAIL ART AND ADULT COLORING BOOKS TOO - Get the professional results you want, whether painting on canvas, figurines, or fingernails or whether using watercolors, acrylics, or oil paints. Great for serious artists and hobbyists, or for the beginner. ?? 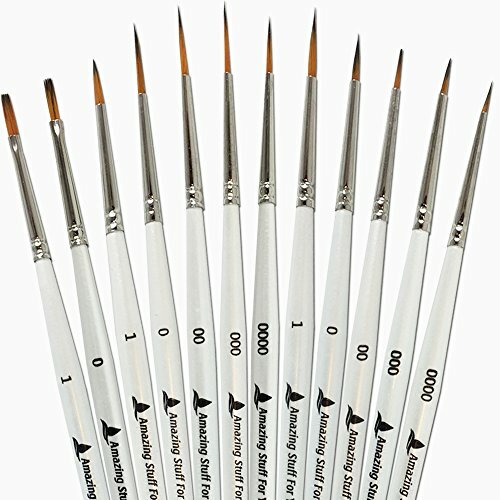 SUPERIOR PERFORMANCE AND RELIABILITY - Durable glue and quality aluminum ferrules ensure bristles don't remain on paintings and a longer brush life. ?? The Manufacturer, Amazing Stuff For You!, Offers You A 100% No Hassle - No Risk Money Back Guarantee! - Click "Add to Cart" Now. Can’t Get the Fine Details You Want? We know how important it is to have the right tools for the job, especially when it comes to painting, and that’s why we’ve created this versatile kit for beginners and veterans alike! All the brushes you need are right here at your fingertips! We believe in our miniature brushes so much that we offer a 100% NO HASSLE -NO RISK MONEY BACK GUARANTEE!.